"This Talyllyn train made a curious and unrhythmical clattering noise, while it proceeded with a strange undulating swaying motion as though the coaches were a string of towed boats surmounting a succession of small waves." From Landscape with Figures , Tom Rolt's autobiography. The Talyllyn Railway is a narrow-gauge steam railway, running through beautiful mid-Wales countryside from Tywyn to Abergynolwyn and Nant Gwernol. 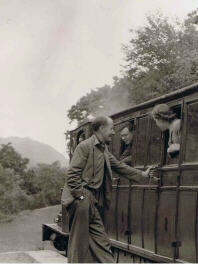 In 1951, Tom Rolt was a founding member of the Talyllyn Railway Preservation Society (TRPS). You can find out more about the railway on the TRPS website. Tom is shown at Abergernolwyn station in 1951, the first season under the Talyllyn Railway Preservation Society. As part of the Rolt Centenary in 2010, Tom Rolt's birthday was celebrated at the Talyllyn Railway. Read all about it.